I have problem with one bolt on Turbo heatshield. The top bolt is stuck and even penetrating fluid does not help. I do not have handy impact driver. Not crazy about these scenarios myself. maybe heat it up a bit and use a 6 sided socket and breaker bar but there's a risk it may shear off leaving the thread behind. I had a similar situation with the O2 sensors on our previous Rav4. I tried to undo it, after driving car. The turbo body was pretty hot. No luck. Did not tried breaker bar. I know you have tried a penetrating fluid on it, but I have read several times that a 50/50 mix of ATF (auto trans fluid) and acetone will get in where most fluids will not. Never had occasion to try it myself, but anything's better than shearing that stud off. And if you ever do manage to remove it make sure you put some copperslip on the threads before you reassemble it.. Does the bolt turn...but not undo? If so, thread could be stripped. I tried to undo it, after driving car. The turbo body was pretty hot. Thing is, the bolt woiuld also have been hot. I'd tackle it from cold, heating the block where I pointed. Thanks, I need to get hold of blowtorch first. Obviously be careful near fuel lines and stuff! Thanks for that. Will try my best. The fuel lines are a little deeper. More worried I am for Oxygen (i think) sensor visible on the picture. I was thinking of buying one for future use. I would have no idea but others might. How about those ones they use in cooking ? Have you tried mole grips then attach length of tube to grips to get leverage. You've got to be kidding first class way of stripping the head a socket is the only tool to use, a good knock with a hammer can help to free up seized bolts too combined with penetrating oil and some heat as mentioned. If you are not in a hurry, soak the bolt for a week or two with some oil. For me the 50/50 acetone atf yas worked best. 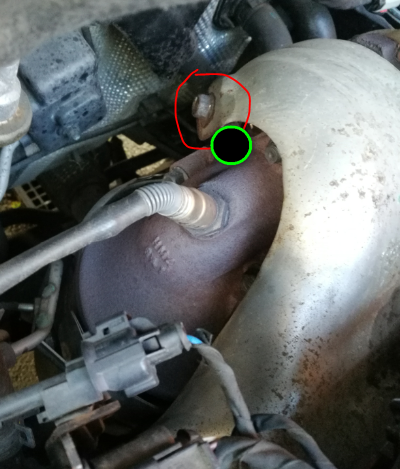 I tried to undo bolt after driving car for about 30 min, but the bolt is stuck solid. Did not tried to hammer it, or use breaker bar. I was afraid that it will sheer off. A light tap with a hammer combined with the heat application might just do the trick as suggested. Too much force will certainly add to the risk of shearing it off, which would be a right pain. Been there done that in my younger years. Do you have, a battery type impact driver? Those things are great for removing tight fasteners as well as driving them home. Use a 6 point socket rather than the more common 12 point for better grip and less chance of damage to the nut. I don't mean use a pneumatic rattle gun, probably shear it off with that, but a good Makita or Bosch type would probably shift it. Or alternatively you could try an impact driver, the type you hit with a hammer, they work quite well also. Failing that I would still be inclined to use something like 50/50 ATF/acetone, build a small dam around the nut with plasticene or putty and let it soak for a couple of days. No luck. Did not try breaker bar. No! very lucky, its a small rusted 12mm ?? bolt! the idiot who mentioned bar should have Lester's f'in mole grips attached to him. Be patient , use one or all of the above formulas , don't force it too much. Use enough heat to make it red hot, but only try to unscrew it when it has cooled down. Lol, I save my mole grips for the very end after my small breaker bar usually in desparation. Thank you everybody for advise. I used 12mm 6 point socket and after not a long car drive, all bolts removed from heathshield without problems. No need for impact wrenches (I was thinking of buying). I bought long ago Stanley socket set, but that are 12 points. The 6 point sockets are more better for removal of problematic bolts. And a short breaker bar or ratchet handle? Yes another problem hits the dust. Good one.! The 12 pointers are more popular because the drive is applied at more convenient angles, but I too like the 6 pointers. They are often hard to find for the common 1/2 inch bar. let's not talks about the Torx. Impact sockets are usually 6 sided and half inch drive. ?